Graise Farm ensures community members have access to healthy, flavorful food from compassionately raised animals. Visit their farm to learn about pigs on pasture, free-range ducks and chickens. Shepherd's Way Farms believes there is a way to live that combines hard work, creativity, respect for the land and animals, and a focus on family and friends. Everything they do and make is in pursuit of these beliefs. Little Hill Berry Farm is a certified organic family farm growing pick-your-own blueberries and strawberries. Come pick the best berries you've ever tasted! 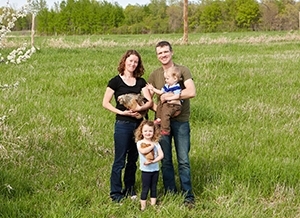 TC Farm started as a family-run farm about an hour west of Minneapolis has grown into a collective of farmers in Minnesota dedicated to raising foods to the highest standards. TC Farm raises sustainable, pasture-raised pigs, cows, sheep, chickens, turkey, and lamb with no GMOs or hormones. Hope Creamery is a traditional creamery making fine handcrafted butter in Hope, MN. They still make small batches of butter using fresh Minnesota cream from area farmers and provide delicious butter for local restaurants and co-ops. The Eat Local Co-op Farm Tour is organized by Twin Cities food co-ops. Our mission is to connect our community to the farms and growers we source our foods from.